BOSTON, May 8, 2012 – Just after midnight on May 3 the engineer of a westward-bound freight train witnessed an extraordinary scene as he barreled toward a railway crossing in Shirley, Mass.—a dog was frantically pulling an unconscious woman away from the tracks. The engineer made every attempt to stop the train but was unable to avoid striking 8-year-old pit bull Lilly before she could clear herself from the train’s wheels. Lilly’s human companion was unharmed but the dog was not nearly as fortunate. The train’s wheels sliced through her right foot, fractured her pelvis in multiple locations and caused other internal injuries. Critically wounded, Lilly lay down next to her companion, who remained unconscious until help arrived. The train’s engineer later told first responders that he witnessed the dog pulling the woman—Christine Spain of Shirley—off the tracks as the train drew near. The engineer, who asked not to be identified, was convinced the train had struck both Christine and the dog, and realized only after stopping and rushing to their aid that Christine was unharmed but Lilly had suffered a catastrophic injury to her right front leg. The engineer immediately called emergency services, who arrived to find Lilly standing guard over Christine, who had collapsed alongside the train tracks while walking home from a friend’s house. Lilly’s calm and composed demeanor—despite the wail of sirens, flashing lights and frantic din from first responders struggling to make sense of the scene—is all the more remarkable given her life-threatening injuries, which by now were bleeding profusely. A Shirley animal control officer immediately drove Lilly to an emergency animal hospital in Acton where Boston Police Officer David Lanteigne, who adopted the once shy and anxious dog five years ago from an animal shelter, recovered her and rushed to Angell Animal Medical Center in Boston. Upon arriving at Angell’s Emergency and Critical Care Unit, Dr. Alice D’Amore immediately took charge of Lilly’s care. The administration of sedatives and pain medicine calmed her enough to allow the veterinary team to determine the extent of her injuries, and plan for the emergency surgery and ongoing treatment she would require. Lilly’s right foot had been completely “de-gloved”—its skin, muscle and connective tissue torn clear away. Multiple fractures to her left pelvis were especially troubling because, should she survive surgery, she could be permanently unable to bear weight or walk without assistance. The veterinary team concluded that Lilly’s right front leg could not be repaired and the only option would be to amputate the entire limb. Lilly braved this surgery on Saturday, May 5. After a short recovery she endured a second surgery to repair her pelvis and rear left leg—which is now supported with steel plates. Lilly’s life will never be the same as she will be unable to bear weight or walk without assistance for the first few months after her surgery. Still, the veterinary team at Angell is optimistic that the spirit she showed as she rescued Christine may be just the trait that sees her through this new phase of her life. Because of the severity of Lilly’s injuries and the extensive treatment she required, the MSPCA-Angell has provided financial aid through its Pet Care Assistance program to help cover the cost of Lilly’s care. In addition to supporting other MSPCA programs, Pet Care Assistance provides financial aid to families whose animals need emergency, intermediate and critical care at Angell. 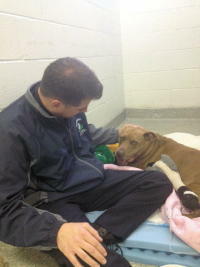 Readers who would like to donate to Pet Care Assistance can navigate to www.mspca.org/helplilly. At a time when pit bulls are maligned and erroneously stereotyped as violent or unfriendly, Lilly’s bravery is testimony to the true nature of these amazing dogs. Far from being aggressive, unfriendly or indifferent, Lilly is a bona fide hero and an ambassador for Pit Bulls everywhere. The MSPCA-Angell’s Advocacy, Law Enforcement and Adoption Center teams have worked for years to challenge the notion that pit bulls are innately dangerous. It is only recently that Pit Bulls have been cast erroneously as villains. At the height of the breed stature in the early 20th century they were often seen as the most decorated heroes in the U.S. Lilly has demonstrated the unconditional love and loyalty that is a hallmark of pit bulls—and many, many other dogs as well. Once Lilly fully recovers from her surgeries she will go home to live with David, his girlfriend and their two Golden Retrievers (whom Lilly adores). Christine has moved in with David to help with Lilly’s convalescence. Lilly’s recovery will be monitored regularly by the veterinary team at Angell to ensure she has every chance of returning to her former self. 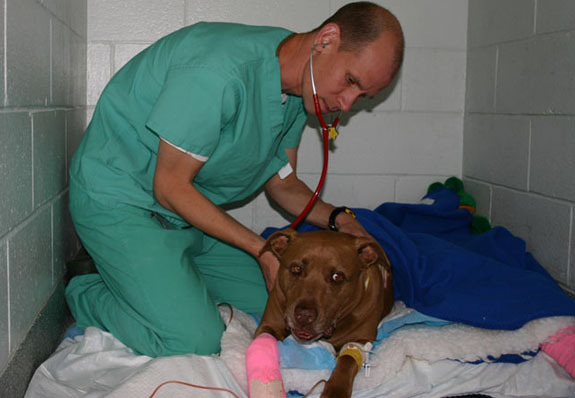 For more information about Angell Animal Medical Center’s Emergency and Critical Care Services click here. Angell Animal Medical Center cares for more than 50,000 animals a year and is one of the most acclaimed veterinary practices in the country. Angell has 67 doctors and an experienced support staff who work as a team to ensure high quality general wellness, emergency and specialty care. With 31 board-certified specialists and technology that includes an MRI specifically designed for animals, Angell is committed to providing a broad range of specialized expertise and experience, but delivers this care with one-on-one compassion that animals and their owners deserve. Angell is open for emergencies 24 hours of every day of the year, and offers night and weekend appointments with our specialty services. Speedy recovery wishes to Lilly! Heart felt thanks to Angell’s Emergency Critical Care Unit! 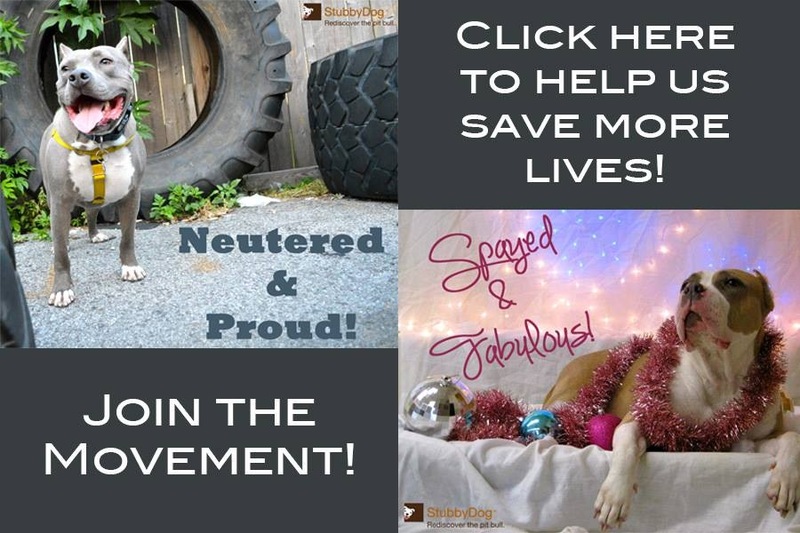 Thanks to Stubby Dog for posting this great story! Too bad the mainstream media doesn’t post more stories showing how amazing these dogs truly are. What a gift to share life with these dogs!! @adoremydogs We LOVE to post stories like this and quite frankly, there aren’t that hard to find either. Thanks for your comments, Lilly is doing great we hear! When this story broke recently it was a huge hit all over my facebook and twitter feeds. People all over the place were talking about it at work, at the grocery story, all over. Some days I feel like us pit bull lovers are losing the battle to convince people how amazing our dogs are. But these few weeks have been a victory, not only because of this amazing story, but because it actually got all of the media coverage it deserved. Bravo to everyone who helped promote this very common story. I hope there will be many more like it to come! I hope and pray for a speedy recovery for Lilly, the sweet pitbull. @avegas72 Lilly is doing well, she had her leg amputated but is home with family and her doggie friends. you can check her out on Facebook.